snuggling on the bench kind of day. Perfection. LOVE THIS! Truly a wonderful day! Oh! What a sweet day! I love the pinecone collecting, stick planting, rock kissing types of days!!! looks liek a fun day, the weather was awesome here too. Spring isn;t far away:-) What are you gonna do with the pinecones and walnut shells would make for some fun crafting. You're like the best mom ever! It looks like you had the perfect day!! I'm so glad it's finally getting warmer too. Awe, sweet:) It was a beautiful day today. We were in the mid60s, maybe close to 70. Cute photo story. Would make a fun scrapbook layout! Thanks for stopping by to welcome me to SITS! Sounds like the perfect day! I need a day like that! Sounds awesome! I want to play! Just passing by via SITS! Ooh...sounds fabulous. We still have snow on the ground here - in fact it snowed again yesterday! So sick of it! 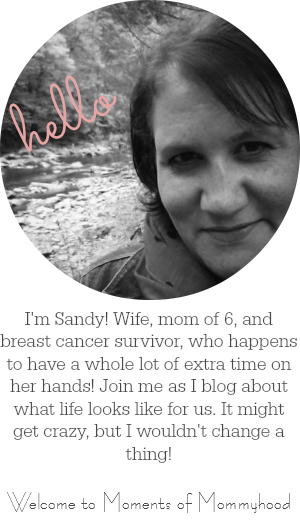 I love your blog layout - it is so cute. I love days that you can spend a lot of time outside. The kids love it, too. Looks like all of you had a great time! What wonderful pictures! It does look like a great day! Thank you for praying for my girls! Bless you! Sandy, once again, my source of inspiration is you! I am grabbing the kiddos and heading outside! Love your photos! They are beautiful and really capture the joy of your day! That is definitely my kind of day! That does sound like a perfect day! Such great photos! Looks like a really great day! Cute photos! I love the days when I get to spend my time just hanging out with the little one! Fun times! How cute! Happy SITS day! Lovely photos! A perfect day indeed. What a great day!Enjoy your SITS day!Great photos! That's extremely sweet =] awww I want a family toooo! Beautiful, fun pics!!!! Looks sooo fun! Happy SITS day! Oh a sweet post! Happy SITS day. Here's to perfect days! Congrats on your SITS feature! What a beautiful family! You're right, family is everything! oh stick planting.....what does it grow into I wonder? Happy SITS day! Sounds like a perfect kid day! Love the cheesy smiles. Hey, I think I use the same font in my blog signature! That really was the perfect day, I mean, it has to be good when you're kissing rocks! Happy SITS! Sounds great! My son is 8 weeks old today, I'm sure I'll have lots of days like that coming up. Can't wait! oh, what cute kids! Happy SITS day! Great photos!! Happy SITS day! What great photos! Sometimes the daily things are the best. There's nothing better than a perfect, fun day with the kids! Hi visiting from SITS. It does look like the perfect day. You have a beautiful family! I grew up with 4 brothers so I know how a big family operates. Now I have 2 girls with 3 stepsons! Funny how life keeps on repeating itself! I love those kinds of days. Snuggle up days are the very best. Sounds like the best! I love your pics! It looks like you guys had lots of fun. I enjoyed looking at the pictures. I love warm spring days playing outside. The best! That's my favourite kind of day. Looks like the kids were enjoying the nice, sunny day. happy SITS day. love the pictures and the story. makes me want a day like that. I love those kinds of days. Happy SITs Day! Looks like a lovely day outdoors! Those are great photos. Lovely snapshot of daily life. Congrats on your SITS day! Aw, it looks like a wonderful day! You guys sure know how to have fun! Congrats on being FB today! It looks like you had a beautiful day! Congrats on being Saucy today! Love the pics, that does look like an amazing day. I love the pictures! Happy SITS day! That DOES sound (and look) like perfection!! This would totally be my children's perfect day - mine, without them, on the beach, sipping a beer. I love days like that! Looks like everyone had a fabulous time!! I especially love the rock kissing! Your kids are gorgeous! What a perfect day, indeed! What a neat way to sum up a perfect day. Congrats on your SITS day. Congrats on being a featured blogger! SANDY!!! I am so excited for you! Going to read your other posts. I love the pictures and you can never take pictures of kids with out one of them having cheesy smiles. Girl... you are skinny! I hate you! LOL! What a great day! I remember those days! So sweet. I love documenting the day to day things. Sounds like a day of perfection! What a perfect day! And I bet today is kind of cool today! It really is the simple things in life. Isn't it?? Hope you've enjoyed the SITS spotlight! I love days like this! Its the days that really make a family, a family. The simplicity of love. Happy SITS day! I love those perfect kind of days! love this post with pictures!!! Looks like it was a fun day for all!! Hi from SITS! Happy SITS Day wishes to you. Looks like ya'll had a great day. Thanks for sharing. I'm so glad spring is finally coming in my little neck of the woods too. Love that Lincoln quote and great photos!!! What a great photo illustration of your beautiful day! That's a fun day! Happy SITS day to ya too! Visiting from SITS. Happy feature day! What a sweet day! I love days like this!! I love moms like you who can embrace the beauty and mess of childhood! Great photos!! What a beautiful family. Bless you for being able to handle 5 kids!!! I can barely keep a handle on my 2 year old alone. But if I could I'd have a ton of kids too. It must be fun. Love your blog and congrats on being a FB! Over here from SITS ... this was soooo simple yet said so much! Loved it! That is a perfect day! I agree--that was my oldest son's birthday! That's the BEST kind of day! It really does sound like the perfect day! AWW, the innocence and fun of childhood! How sweet! I love the pictures -- your family is beautiful. What a lovely picture story! I love those kinds of days! Very special! Again, Congrats on being the FB. Darling girls! Happy Sits day! Happy SITS Day! Woo hoo for you! Happy Sits Day! Great pictures! What an awesome day. I love it! They're so cute! Happy SITS day! What a great I-love-my-life post! Seriously, did you steal my children? I thought mine were the only ones who collected pinecones and walnut shells. Phew! :) Love the concept!